PC cooling, chassis, PSU and peripherals maker Cooler Master has revealed a new rigid gaming mouse mat with RGB LED illumination. 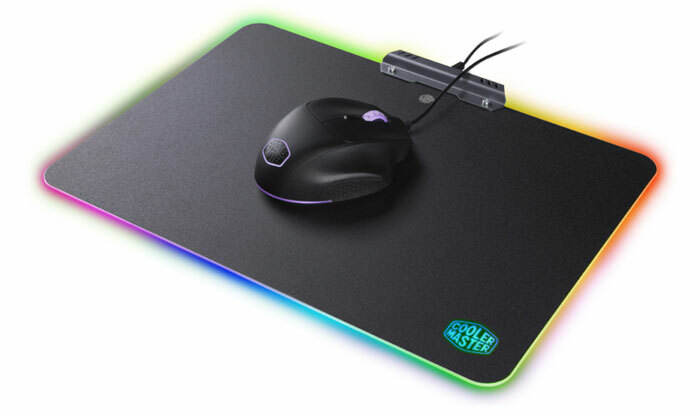 The new Cooler Master RGB Hard Gaming Mouse Pad is aimed at pro-gamers / eSports pros and claims to offer optimised gaming qualities and durability (backed up with 2 year guarantee). Cooler Master has equipped its new mousing surface with a textured, low-friction coating that is “optimized for peak performance”. It says that the silicone-on-steel surface is specially designed and calibrated to enhance the precision of optical and laser mice sensors. To keep this rigid mouse mat steady “in the heat of battle” Cooler Master has fitted a quintet of large rubber pads to its underside. Overall the weight of the device will help it stay put too, it weighs in at 808g (1.76lbs), similar to a PC keyboard but smaller and denser. The mousing surface isn’t that small though, it is 350 x 264mm (and 2mm thick), approaching the width of a TKL PC keyboard. Of course, as an RGB LED lit accessory this hard mouse mat requires a power source. Cooler Master has decided to power this accessory via durable braided 1.6m USB cable. For your RGB LED thrills there are nine vibrant preset light animations and effects to deploy. 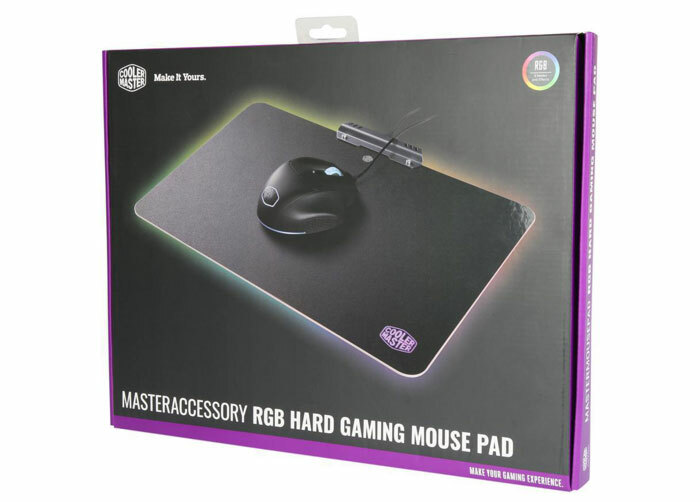 Cooler Master says this is enough to personalise the mouse pad to fit in with your existing RGB LED gear but the RGB Hard Gaming Mouse Pad isn’t said to feature compatibility with RGB LED standards such as Asus Aura Sync, Gigabyte RGB Fusion etc. Thus you will have to rely on a little luck to blend this in with the rest of your PC system lighting. The Cooler Master RGB Hard Gaming Mouse Pad is already listed as available in the US, at Newegg, for a reasonable $29.99. Probably because Razer, Corsair, SteelSeries, E-3LUE, Ajazz, Thermaltake, 1stPlayer, and just about everyone else has already released their own? Only those who leave their RGBs set to default Scrolling Rainbow Display Mode… which is annoying, especially on a keyboard!